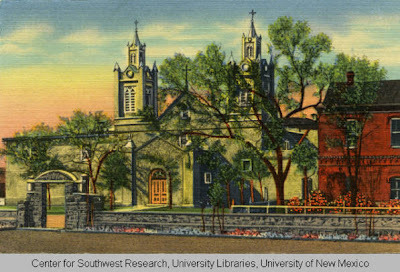 The sound of the bells of San Felipe di Neri church, in Old Town was the uniting factor. Anyone within their radius understood their language, and heeded their every word. Like a large, very obedient, family heeds a domineering mother. Together, we were La Campanella. Loosely translated, it means "Brotherhood Of The Bell." Martineztown had it's own Campanella, So did Barelas, as did all church parish societies. like all family units, we identified with our church, and like all family units, we worked, played, fought, feasted and intermarried. Within those family units, one could find both the good and the bad characteristics of any family, but we remained united in sickness and in health, whether richer or poorer, from our birth, to our death, and it was this unity that helped us get through the hardest part of the 1930's. Albuquerque owes most of its survival to these Campanellas, not just in the 1930's but from its very beginning, it was the church bells that warned us of imending dangers, and the unity that developed at having to band together to confront a mutual enemy, or help each other in any crisis. The depression was just another one of these crisis and the people were already programmed to act at the sound of their own church bells. The bells of San Felipe didn't ring when the stock market collapsed in 1929., but those bells had created a parish unity that transcended all social and political barriers, just as sure as if the crash had been a fire, or an earthquake. In the 1930's New Mexico was still relatively isolated from the rest of the United States, which is why we were the last to let go of the rules set up by the Holy Roman Empire., and Spanish knighthood, commonly known today as chivalry, but is really no more than common civility. In a crisis, a gentleman protects the old, the sick, the weak, and helpless animals. " In Old Albuquerque, the animals came first. Even today, New Mexicans reason that animals are more apt to panic, most humans do not. Feed for our domestic animals was mostly home grown, adobes were made right on the premises, using your own clay and straw to make them. Meats? we had our live stock, plus goats and cows for milk. Telephones and electric lights not a problem, we didn't have either, so we didn't know what they were. Everything at the store was dirt cheap, but no one had any money. Movies were as little as five and ten cents, and as much as a quarter, but only an occasional treat to us, and only very special movies. dances,sandlotbaseball , kick the can, red rover, jacks, hopscotch, blind man's bluff, hide and seek, treasure hunts, board games were just a few of the games that kept the young ones entertained, visiting each other and family get together at Baptismals, Confirmations, First Holy Communions, Weddings and Birthday parties at each other's homes were festivals, tons of food, all home grown and prepared by the women of the families. Anyone who remembers Church Fiestas, Las Maromas, (Medicine shows without the snake oil spiel.) will agree that the things that mattered most were not how much money you had in the bank, how big a house or how many houses you owned, but the relationships that you had in the Las Campanellas that mattered.